Come and sample some of our famous apple butter, featured wines and other delicious Apple Holler specialties. Our nostalgic Country Store is filled with unique seasonal and year-round décor, children’s toys and activities, beautiful hand-made crafts, soaps, lotions, confections and many special gift items including candles and clothing. Make your way to Grandma’s Pantry where you will find rows and rows of homemade jellies and jams, salsas, dressings, soups, candies and more. Enjoy a diverse selection of Wisconsin wines and cheeses, New Glarus Beer or perhaps some fresh picked apples. Peruse our mouth-watering bakery items, made in our own Apple Holler Bakery. Take home one of our delicious apple pies,(other seasonal pies available as well) apple cider doughnuts, apple fritters or a turnover. Don’t forget our own fresh, apple cider to wash it all down. Take home more Apple Holler favorites when you top off your visit with one or more of our fresh gourmet caramel apples. While in the Apple Holler Bakery, take advantage of our holiday pie pre-ordering, and get your pie orders in before the holiday rush. Enjoy homemade, award-winning pies and apple cider donuts that are made from scratch with only the finest ingredients. 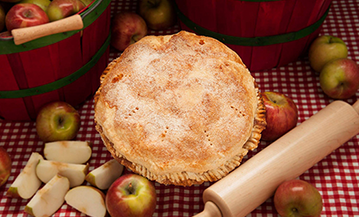 See all of our apple and fruit pies that we sell both in-store and online. Choose from over 24 different flavors! 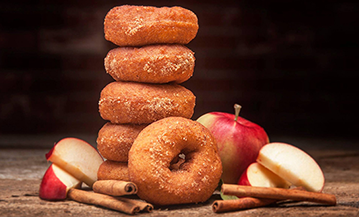 Enjoy our delicious donuts made fresh daily with our own Apple Cider right from the apple orchard. Purchase Pies for Pick Up Online! We offer 24 varieties of our delicious homemade pies for pick up that you can purchase through our online store. Each pie is made from scratch with love by our talented bakers.